Membership offers a newsletter of art-related events, festive opening receptions, Special Events, Discounts on original works of art; and for Artist/Members, a listing in the Artist’s Directory, client referrals and exhibition opportunities. GFAC Members ARE the organization. We welcome you to join, be active and prosper. We cannot accept cash payments online. Please print this form and send it along with your check to the Greater Flint Arts Council, 816 S. Saginaw Street, Flint MI 48502. Thanks to our great volunteers, each year we are able to produce five outstanding festivals during the summer months and 12 wonderful gallery Artwalk openings during the 2nd Friday Artwalk. Yet, to keep from wearing out our volunteers, we are always in need of those who are interested in lending a hand. Whether you are in a group or organization, or an individual with a few hours to spare, we’d like to hear from you. Are you interested in becoming a volunteer group leader to help us in organizing any of the volunteer programs or would you like to volunteer for a specific task? Would you like to meet new people and share skills? Would you like to learn Event Planning? We have forms at the Arts Council that you can fill out to let us know your preferences or you can email Cathy E. Johnson, Director of Programs, at cathy@greaterflintartscouncil.org. Find out about the opportunities that are available to you. Call 810.238.6875 for more information. Prior to his death in 1963, President John F. Kennedy laid the ground work for a national agency which would foster the growth of arts and cultural programs throughout the United States. Tragically, President Kennedy did not live to see his dream fulfilled. Posthumously and in his honor, Congress founded the National Endowment for the Arts. Within a couple years individual states responded with the establishment of state arts councils and in 1965 Michigan opened the Michigan Council for the Arts. Soon after, local municipalities responded by forming local arts councils. There were local arts council movements prior to the 1960’s, however the 1960’s movement was the strongest and most of the arts councils in Michigan were founded in the late 1960’s. The City of Flint was soon to follow when a local group of citizens established Greater Flint Arts Council, incorporated on October 11, 1967. Among them were Forest Alter, Ruth E. Steffe, Ronald H. Tali, Werner Graf, Helen Hardy Brown and Arthur H. Sarvis who all signed the charter and became the first GFAC board of trustees. Ruth E. Steffe is listed as the first Resident Agent. We assume she was also the first GFAC Board President. Assets were listed as $100 cash. With a mission of “the coordination, education, promotion and development of cultural activities in the City of Flint, Genesee County and surrounding areas,” they met in private homes and buildings operated by Flint Community Schools. The first registered office of GFAC is recorded in 1973 as 803 Citizens Bank Building. We assume it was the business office of GFAC President, Mourice D. Frost. In 1977 their office was listed as 924 East Sixth Street presumably the business office of then President, Ann Elgood. Shirley McNally became GFAC President in 1980. In 1984 Jack LeSage became president. In the mid 1970’s Greater Flint Arts Council hired their first Director, Lynne Smith who continued on to become the Director of the Michigan Association of Community Arts Agencies (MACAA). She was succeeded by Sarah Warner who helped GFAC open their first store front gallery at 420 S. Saginaw Street, the former home of Roberts David Allan clothing store. It was during this time in the early to mid 1980’s when GFAC entered into some extensive long range strategic planning. We produced two conferences in 1981 and again in 1985 called “Where’s Art?.” It was during the Where’s Art Conferences that our current mission was forged…”to be a catalyst of and advocate for increased artistic and cultural enrichment of our ethnically diverse community.” GFAC would focus our energies on community cultural assessment, cultural diversity, communications, advocacy, arts education, technical assistance, funding and exhibitions. An involved group of artists converged at GFAC at this time and many new projects were seen including BRIX magazine, post cards, coloring books, cultural directories and an artist directory. Also at this time other agencies began to incubate from within the membership and the Buckham Alley Theater and Buckham Gallery were conceived. Sarah Warner was hired as Development Manager for the Flint Institute of Arts and Jan Murdock succeeded Sarah as Executive Director of GFAC in 1990. The Arts Council was moved to a storefront space in the Capitol Theater Building, 130 E. Second Street. Formerly the development professional for GFAC, Jan began many innovative new programs including Regional Regranting, ARTSHARE, City Arts Team and Alley Oop, a summer festival in Brush Alley. Jan Murdock took a position with the Flint Community Schools in 1993 and the search for a new director began. With their new status as a property owner the year that followed brought great change to Greater Flint Arts Council. The success of the project to save the Peerless Building and the constant media attention shaped a new era of public opinion about GFAC and their ability to serve our community. Attendance at GFAC produced events increased dramatically. “Ask the Arts Council” became a staple response to many inquiries and GFAC staff were asked to serve on many boards and committees. Resources became available to help GFAC become the leader in the arts community. William White, President of the Charles Stewart Mott Foundation was impressed with how GFAC, an agency with no assets and limited resources, could gain community support to purchase and renovate a vacant building downtown without funding from the foundation. He approached Greg Fiedler to serve on a team to study downtown revitalizations around the United States and help formulate a plan for the successful revitalization of downtown Flint. The results of that teamwork was the founding of the Uptown Re-investment Corporation. Uptown immediately gained a State of Michigan grant and purchased eight vacant properties on Saginaw Street. To help Uptown, local developers formed an LLC to partner in the rehabilitation of the vacant properties. Work began and Uptown took on the downtown streetscape as a starting point to improve the overall look of downtown as they began to transform vacant properties into centers of community vitality. 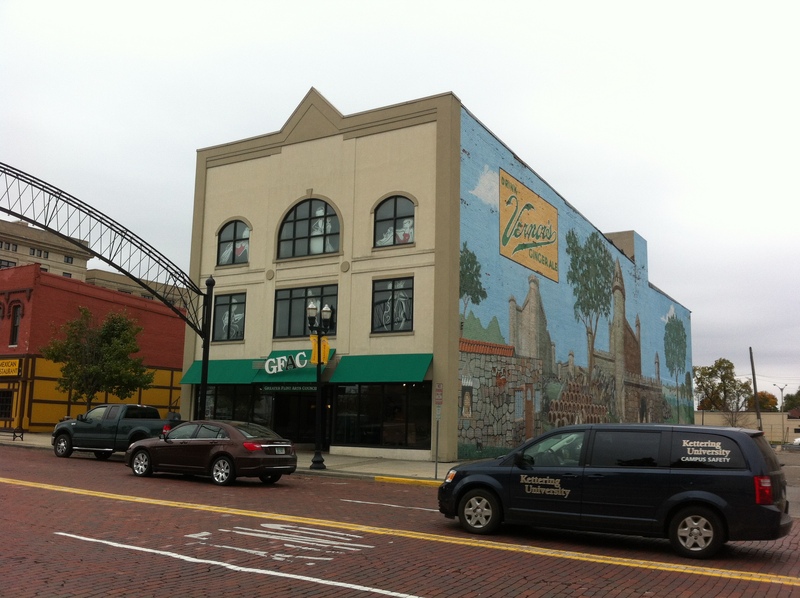 In response to the efforts of the Uptown partnership, GFAC created programs to enhance life for the community and bring positive attention to the downtown Flint region. In 1999 GFAC launched the Parade of Festivals project. This project would market existing festivals in a package throughout the State of Michigan, give financial support to festivals and incubate new festivals. It was proven in communities around the country that festivals can draw attention to downtowns and spur interest in their revitalization. GFAC founded the Tunes At Noon Festival and helped the establishment of the Memorial Day Festival, Folk Music Festival, Flint Film Festival and Summer Theater Festival. With the expansion of the summer festival season and the continual growth of the ARTWALK program community attention turned to downtown Flint. In 1999 the Parade of Festivals project began with a partnership between 7 festivals. In 2011, the Parade of Festivals partnership will include 20 festivals. Opportunities to respond to the needs of the community began to pour in. Since the reorganization of the Michigan Council for Arts and Cultural Affairs (MCACA) by then Michigan Governor, John Engler, our CEO, Greg Fiedler noticed that Flint was not receiving an equal portion of the State funds in comparison to other similar cities. He inquired to the MCACA staff and the Senior Program Officer, Ed Nelson came to Flint for lunch. As a result of Mr. Fiedler’s inquiry Mr. Nelson did some research and found that Flint was not asking for enough of the State funding and that is why they were not receiving more. Mr. Fiedler made arrangements for a special MCACA workshop to be held at the Anderson Room in the Flint Institute of Music. Thirty Five arts and cultural non-profit organizations were represented at the workshop. MCACA staff were very helpful in suggesting which categories each agency should apply for. As a result more funding was awarded to Flint agencies in the next granting year (FY 1999) and all three of the Cultural Center organizations, Flint Institute of Music, Flint Institute of Arts and Flint Cultural Center Corporation were accepted as Anchor Organizations. This is a permanent honor which allows each organization to ask for up to 10% of their budget annually. In 2002, GFAC stepped up to lead the Community Cultural Plan. Consultants, Morrie Warshawski and Sue Wood were hired to manage the project. Representatives from more than 100 arts/cultural agencies participated. The first year of work produced a comprehensive assessment report entitled Forging Links. This was followed in 2004 with the publishing of Flint’s first Community Cultural Plan. Implementation of the plan has produced some positive innovations including the community-wide event website: geneseefun.com. When local promoter Joe Freyre, who produced the Flint Jazz Festival for 19 years called GFAC and told us he was having health issues and needed help to produce the festival, GFAC hired local promoter Clyde Lee of Flint to work with Mr. Freyre to insure that the 19th Annual Flint Jazz Festival would take place. A year later in 2000, on the 20th Anniversary of the Flint Jazz Festival, Joe Freyre had a stroke and was completely unable to work. He asked GFAC to take over the festival and make sure it survived for years to come. GFAC has now produced the Flint Jazz Festival for eleven years. When the City of Flint was declared bankrupt and taken into receivership, GFAC took over the management of the Flint Fourth of July Festival in 2003 to improve the morale of a community in despair. In 2003 Buckham Gallery lost their funding from the Michigan Council for Arts and Cultural Affairs. GFAC immediately came to their aid. GFAC President and CEO, Greg Fiedler joined their Board of Trustees, helped them secure funding for reorganization from the Charles Stewart Mott Foundation and invited them to be a partner in the GFAC Annual Art Auction known today as the Cool City Art Auction. GFAC was approached by local film makers in 2001 who said the needs of local film makers were not being met and asked GFAC to start a local film festival to draw attention to the art and to unify local film makers. GFAC accepted the challenge and in 2003 produced the First Annual Flint Film Festival. Three groups of local film makers served on the planning committee the first year including Equinox Productions, Fifth Sun Films and Blackmore Productions. GFAC produced this festival for three years until the planning committee decided to take it to the next level – independent. In 2006 the Buckham Alley Theatre (BAT) lost their home when their landlord sold the property to a new company. GFAC took BAT into our building providing storage, office and rehearsal space. We helped them find performance spaces and helped them secure funding from the Ruth Mott Foundation to help with their reorganization. Three years later we still seek a permanent affordable performing space for BAT. At the present time they are stable, have built up a small reserve cash account and are producing quality theater. Their recent production of “Escanaba In Da Moonlight,” a BAT favorite, had a successful touring run to four communities including Holly, Durand, Almont and Frankenmuth. In 2007 Red Ink Studios and Art at the Market approached GFAC requesting consultation in fund raising. We asked both of them to become a partner in our Cool City Art Auction. This not only provided them with funds immediately but also walked them through the process of producing a fund raising event. With this knowledge they would be able to design and implement their own future fund raising events. GFAC invited the youth arts group in downtown Flint, the Creative Alliance to join the Cool City Art Auction in 2009. It became their best fund raising event to date. GFAC began an in-house business for the production of public art for corporations and other organizations. In the past decade GFAC has commissioned more than 100 works of public art in corporations throughout Genesee County. The Ruth Mott Foundation enlisted GFAC to design and implement a summer outdoor sculpture program at the Charles Stewart Mott estate, Applewood. The project, Art In The Gardens, became an annual program. Michigan artists apply to show their work on the estate from May to October. The proposals are juried and the selected artists are paid a stipend for displaying their work. In celebration of the 31st Annual Flint Jazz Festival, 2011, GFAC formed a partnership with downtown restaurants and pubs and the Flint JAZZWALK was born. Mulitiple venues showcase live jazz by local musicians. This is now a monthly event on the 4th Thursday each month. In 2012, GFAC incubated a new festival called “DROP FEST.” This is an electronic music festival that will emulate the Detroit festival in Hart Plaza. In 2013 GFAC partnered with the City of Flint to incorporate a Community Cultural Plan into the city’s Master Plan. This collaboration was funded by the National Endowment for the Arts. In 2014 GFAC provided funding to incubate the first Bluegrass Bazaar Festival at Kearsley Park. These are just a few of the countless ways GFAC has seen an opportunity and responded. On a daily basis GFAC fields dozens of requests for information about classes, opportunities to perform, artists to perform certain tasks and groups looking for space to present their programs. We do our best to provide the correct referrals to every request we receive. The future of GFAC will see us responding to the needs of our community members for spontaneous opportunities for creativity…what we call emerging arts. We believe that emerging arts can transform our community and we can create an atmosphere where the arts can emerge.